LED stands for light-emitting diodes. 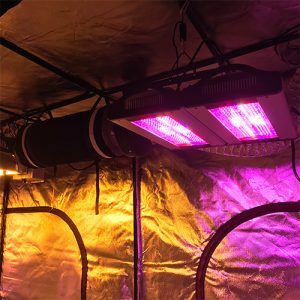 LED grow lights have rapidly come down in price and home growers everywhere are starting to make the switch to solely using them as their lighting option. Maybe you don’t care about leading the charge, and you simply want a lighting system that produces extremely low heat, comes ready to plug-and-play, and can produce high yields with incredible energy efficiency. If so, look no further because LED is the perfect lighting option for you. For calculating cost, expect to spend $1.50-$3 per watt depending on quality and brand. Remember that while most LEDs cost more per watt than HID lamps, they do not require a reflector or ballast. As well, LED lights last for decades where HID bulbs will often need to be replace every couple of years. 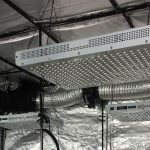 Most common type of LED grow light and most offer growers all they need for their lighting setup. They include heatsinks for removing heat, a driver (think of it as a ballast), and often come with a warranty. 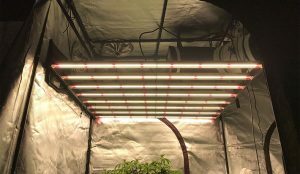 Many growers add LED bars as an easy way to expand their lighting footprint or change up their light spectrum. LED Bars are a single row of diodes that come in different spectrums. Quickly replace all your old CFL bulbs with LED bulbs that will give you all the added benefits of LED grow lights. The best LED light spectrum is a controversial topic among growers. Most LED lights use a of mix blue and red diodes, with blue preferred for the vegetative state, while red light is preferred for the flowering stage. Blue and red light are used because these two lights drive plant photosynthesis while also being very efficient to produce. This leaves a large gap in the middle of the light spectrum with very few LED lights providing orange, green, and yellow diodes to cover said gap. The debate lies in whether plants need these other colors. A plant can grow to incredible potentials with just red and blue light, however, despite the common belief, plants’ absorb green light. In fact, recent studies show that this light drives photosynthesis better than red. Unfortunately, green diodes are terrible at producing an efficient number of photons, and it’s best to avoid LEDs with them. This is why some growers still prefer HID lighting because HPS (High Pressure Sodium) bulbs spectrum delivers green, yellow, and orange light much more efficiently than LED creating a more efficient PAR spectrum. 1 blue diode for every 3 red diodes is a great starting ratio and will deliver the best spectrum if you could only use one for the entire growing phase. Those that are looking to replace their CFLs will love the Cirrus EVO for that reason alone. You’ll often see white diodes which are fine, however, you will want to know what the temperature color of white diodes are. If they are between 5200-8300K then they are preferred for the vegetative state. If they are between 2700-3,750K then they are great for flowering. They may cause the most confusion among growers and offer a higher learning curb, but that’s not stopping them from dominating homer growers’ gardens. They are currently the most affordable light in the long run, the bulbs last for decades, and they are very easy to install. 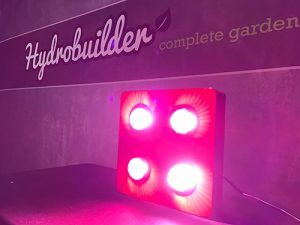 Most growers will compare LED and HID grow lights when deciding which to use. Because LEDs are rapidly improving, it’s somewhat difficult to keep track of the gap that used to be between them and HIDs. 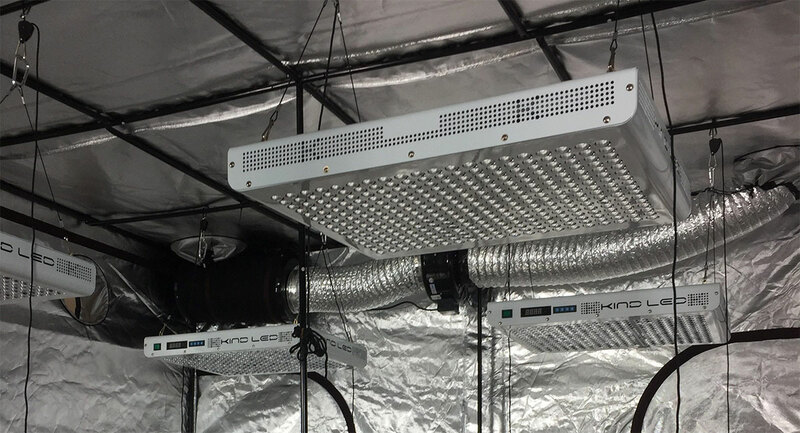 Most still believe that HID lights produce bigger yields per watt, but many growers that use LEDs believe they produce higher quality yields compared to HID grow lights. Just make sure you keep these lights decently far from your plants: 1-2 feet. For the precise distance make sure to check the manual that comes with the lights. LEDs with 1W chips can be closer (12”), but it’s much more common that you’ll have 3W and 5W chips which will push your distance closer to 18-24” away. LEDs are very directional and don’t spread out the light like a HID light so a PAR meter is advised. When used together you can easily create an even light footprint that beautifully covers your canopy that is unmatched by other lighting options. Using a light mover will greatly help with light coverage and avoiding hot spots. Last, while considering wattage for LEDs is not as important as it is for HID lights (photosynthetic photon flux density and daily light integral are better metrics), a good general rule of thumb is 23 watts per square foot of growing area. So a 2’ by 2’ space would give you an overall space of 4 feet and will need at least 128 watts. To learn more about grow lights, check out the other articles in our learning center!